It’s common knowledge that to be a doctor is more than a mere profession. For the best, it’s their life’s calling and not one that can be taken lightly. As anyone with a doctor in their immediate family knows, a doctor is on call 24/7 for the better part of a year’s 365 days. Now, take that level of personal dedication and add having to deal with limited access to the right medicine at any given time; or sometimes, to no access to any medicine, period. Add not being able to easily converse with a patient in the patients’ native tongue. And lastly, add being placed in conditions that could only be described as “grueling” on a good day. This is the life of a doctor with Medecins Sans Frontieres (MSF). This is the life of their next interviewee, British doctor, Javid Abdelmoneim. 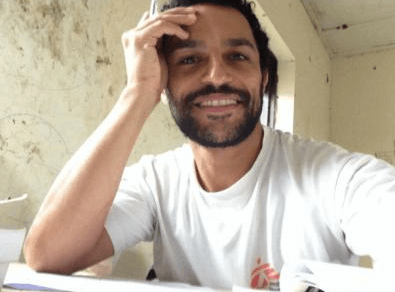 As an MSF doctor he’s worked in Iraq, Haiti and Lebanon. He recently completed his fourth MSF mission. This one in Sierra Leone; a posting which put him on Ebola’s front lines. They had the immense pleasure of meeting with Dr. Javid when he was in Athens for his TEDx talk in November. In a day full of inspiring talks, his was one that they can easily say touched – and broke – hearts. He started off by warning his audience that he was going to show graphic photos which he took while on the job in South Sudan treating Ebola patients. Judging from the gasps soon emanating from the audience, his warning was much needed. All in the auditorium were captivated – a picture really shows the heartbreak that a million words might fail to express. After his talk, Javid asked them if he “went too far” with the photos. In truth, most of them were very difficult to behold. But what he accomplished with his heartfelt words and heart-wrenching photos was humanizing his patients; both those he helped save and those he helped bury. Each and every single patient impacted him greatly and they believe him when he says that he won’t forget any. 1) Becoming a doctor is choosing to do a very selfless profession to begin with. But what sort of doctor is the one who is attracted to working for MSF? I think you will find in me and other MSF workers a combination of wanderlust, adventure seeking, fearlessness and, most importantly, a recognition of the need of others less fortunate and a willingness to working towards addressing those needs. 2) What was the catalyst that inspired you personally to join MSF? I am not sure really. I first heard of them as a medical student when they campaigned for access to medicines for neglected diseases. It seemed a very worthy cause and so I kept a closeness to MSF since then. 3) Mobile clinics are far removed from traditional hospitals. From your experience, what is the most difficult part of practicing medicine from a tent? When you find an illness in someone that is easily treatable but you haven’t brought the appropriate medicines, that breaks my heart. What can you do? Carry a whole hospital? 4) Have you ever faced opposition from the native populace when the medical team arrives? In Haiti, understandably, at the beginning when cholera was new, the population had a fear of us since they were wherever the disease was. The hospital was attacked and ambulances had rocks thrown at them. 5) What would you say to people who may be hesitant to monetarily support organizations such as MSF for fear that their funds won’t ever reach the people in need? MSF produces transparent reports every year. In MSF, 93 pence of every £1 goes directly to patients. Money that is donated for a particular cause, for example Ebola, is guaranteed to be spent for that cause only and within one year. These reports should be available for every charity. Do your research before donating. You’ll see MSF is the best! 6) I read in an article that after returning from Sierra Leone, you advised people to not shake your hand until the three week incubation period for the Ebola virus had past. Are you ever scared for yourself when treating victims of such terrible diseases? I did that to offer psychological ease of mind to my friends. The real risk of their contracting it from me is close to almost zero. If I didn’t have a certain fear in the ebola context I would be foolish! It is necessary to maintain vigilance at all times when treating ebola patients and so a healthy fear helps maintain that level of vigilance. 7) What is your advice concerning the Ebola outbreak? How can people guard against its spread and, in your opinion, can it be eradicated? Knowledge will protect you. Do not be ignorant. Arm yourselves with facts about how it is spread and keep a calm head! Can I emphasise that the best way to keep Europe ebola free is to deal with the epidemic in West Africa effectively, not by closing borders and closing our hearts/minds. 8) What would be your answer to people who might characterize you as either a daredevil or a saint for the amazing yet difficult work you do in volatile lands such as warzones, or disease stricken countries? As I alluded to it in Q1 there must be an element of that in my character in order to leave my comfortable home?! But as you can see from my TEDx talk, I don’t believe I am either a saint or daredevil, I believe in the worth of each and every person and the preciousness of life.